CloudLab is a flying science rover. It launches from the runway, lands in the target biome, and can be driven to additional nearby biomes for maximum science collection in a single sortie. It can carry all scinece instruments as they are unlocked. Its onboard lab can process results for more return on transmission, reset materials and goo for multiple uses, and store multiple copies of experiments. Finally it can be flown back to KSC for maximum cost recovery. Crew: If you prefer SAS in flight and manual landings, take a pilot. 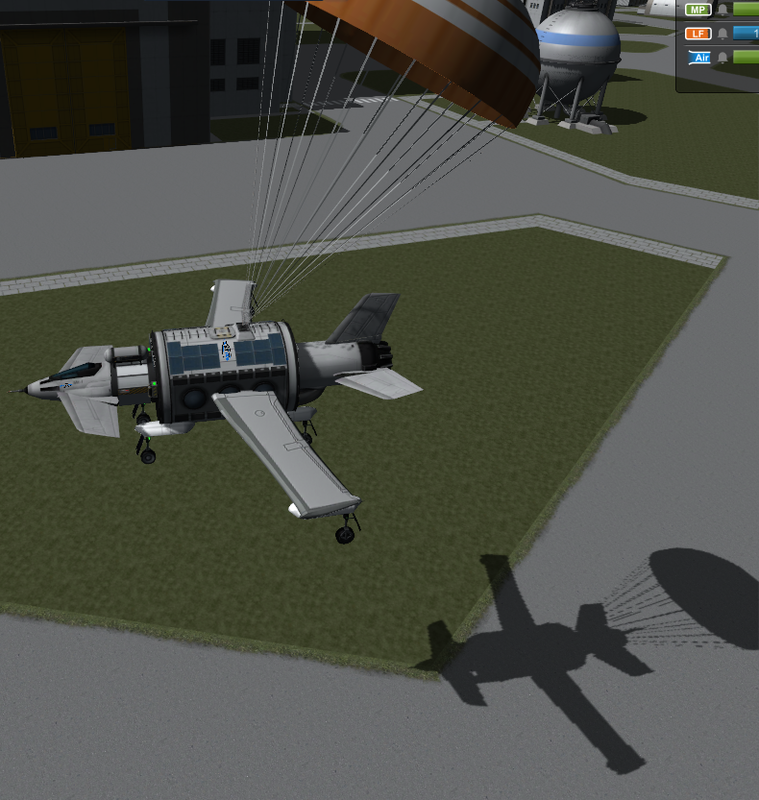 If you prefer to land by parachute, take an engineer to repack the chutes. Make sure there are two scientists in the lab before takeoff. As you unlock more science instruments, attach them to the sides of the Science Jr module. The empty node on the aft end is for the nosecone sensor. Add more solar panels for more power generation. If you add retractable panels, don’t forget to retract them before flight. Upgrade antenna for faster transmission. Upgrade batteries for a larger tranmission buffer. CloudLab E1 is the single-engine variant, a more cost-effective craft for medium-range sorties. Range: Able to reach 6 of 9 biomes round trip. Poles and Badlands are out of range and water landings are not recommended.